NOTE: “Empty” and “Low Ink” alerts are COMPLETELY NORMAL for all HP 92, 93, 94, 95, 96, 97, 98, 99 ink cartridges which have been refilled! While at first this may be an unusual workflow, it does allow print operations to proceed. 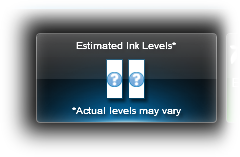 Following HP 92, 93, 94, 95, 96, 97, 98 or 99 ink refilling, the printer cannot track the ink levels. NOTE: You may not ‘Cancel’ (X) the alignment page until you press “OK” to start alignment. You may then cancel the alignment just prior to when actual scanning occurs; printer will default to the previously stored scanned settings.